Let us walk, in imagination, along Church Street in it’s early convict period. Reference has already been made to the huts erected for the women and for married convicts. They probably lay between George Street and the river. Between George and Macquarie Streets, on the eastern side, stood a number of buildings owned by the Crown. Near the George Street corner there was a barrack, erected either by Governor Phillip or Governor Hunter, which was demolished in 1818. On the southern side of this building the barrack of the Superintendent of Stock stood, but it also was demolished prior to 1823. 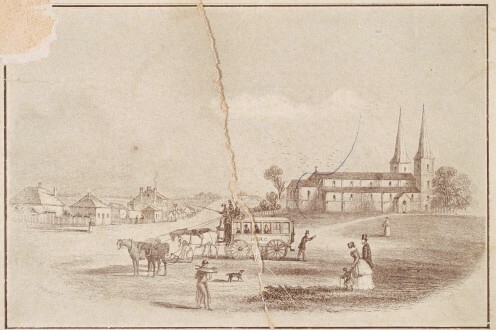 On the north-western corner of Church and Macquarie streets stood the residence of the Rev. S. Marsden, and in later years the school of Rev. John Eyre. Tull's school, as mentioned earlier, was on the site of the post office, and the Court House stood on the south-western corner of George and Church Streets. The record of leases issued in 1823 enables us to determine the occupiers of land in Church Street. Commencing from the river, the following persons occupied leases on the western side of the street, between the river and Phillip Street: William Barnes, George Smith, John Beale and Charles Stuard; the latter's lease was at the north-western corner of Church and Phillip Streets. Barne's lense ran through to Marsden Street. The land, later purchased by Barnes, was offered for sale in 1835. At this period a slaughter house stood on the site. Charles Stuard also leased the land at the south-western corner of Church and Phillip Streets. John Malone and John Lacey leased the blocks between Stuard’s and J. Stephenson's lease, which stood at the north-western corner of George and Church Streets, An inn known as "The Straggler" kept by Lacey, stood on his lease in 1817. Stephenson kept an inn "The Glasgow Arms" on the site of the present White Horse Hotel. Apparently a new building was erected on this land in 1834. An 'advertisement in the "Sydney Herald" of June 9, 1834 referred to … J. Ward having taken the newly erected house at the comer of George and Church Street, had on sale drugs and groceries.This building, used some years later as the inn known as "The White Horse Cellars, is said to have been built by John Thorn, chief constable of the town.